Oh man, I never intended on missing almost a whole week for a blog post. In fact, I'm typing this one up only about 30 minutes before you'll actually see it on a Friday night. What a slacker. I decided to take a break, that last Sunday all I had to do was write up ONE POST, and that I'd get to the rest of it later. Uh, yeah... we all know how that one turned out. Whoops. So I thought I'd talk to you about my purse collection, which is actually a lot smaller than it used to be. I love purses, and I often buy them on a whim. Not so much lately, but it led to a lot of buyer's remorse in the past. I'd be all "I NEED A RED PURSE!" and then go and buy one and one week later think about how it wasn't me and I needed a different one. I always tend to go back to the same favorites all the time anyways. Like my Betsey collection (see above). 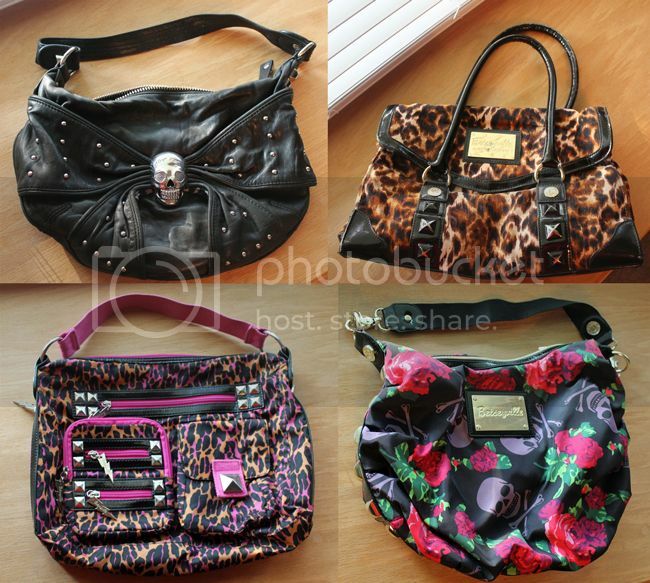 Top left, is probably the most expensive purse I own (still got it "on sale" though). I bought it at the Betsey Johnson store (back when those existed, two summers ago) on my trip to Michigan with my mom. It was my special vacation souvenir - a REAL Betsey bag (as in, not just a Betseyville). The leopard Betsey bag was another "souvenir" from my short "mini-moon" stay in downtown Chicago with my husband shortly after our wedding. That was also from a Betsey store, this time the one that was in Watertower (RIP Betsey Johnson stores! Oh how I loved you!). They had a buy one get one 1/2 off sale and I got a dress and this purse. I should probably part ways with this purse, since I dont think I'll use it again. Wonder if it's sellable, even in its well-loved condition? The above bags are my "regular"(as in, no specific name brand) purses. The top silver one is from Kohl's, and it's what I'm using right now. I bought it several seasons ago, when ruffles were pretty popular. I like the rings attaching the handles to the bag because I can clip my keys to them. The yellow bow bag I purchased from Ruche. When it originally was posted, it sold out, and I was so mad! I stalked this bag for a good two weeks until it was either re-stocked, or somebody returned one! So I snatched it up right away! Score! I still love this bag. Check out the cool peacock feather lining! Above are my "fancy" bags. You know, for all those times I dress up? Okay, okay, it's for when someone invites me to a wedding and I have to have a "nice" purse. 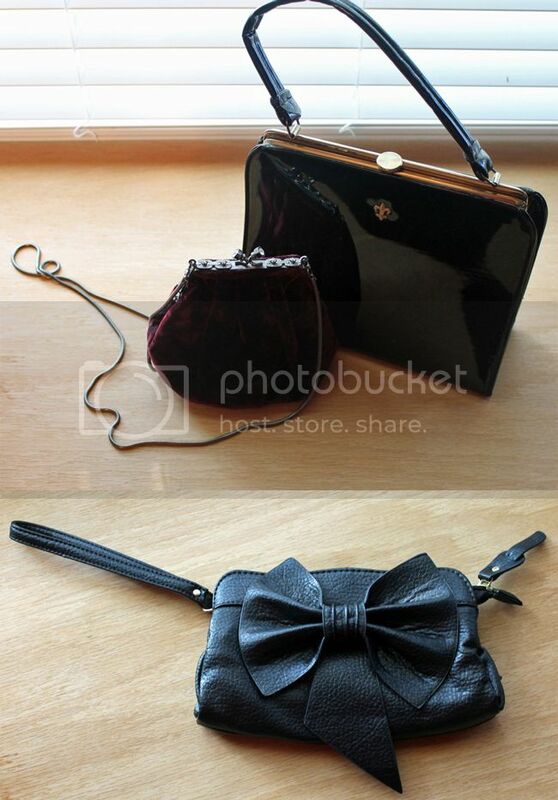 I have one patent leather vintage bag, one tiny maroon velvety bag, and one faux leather bow clutch/wristlet bag. They all pretty much fit my phone and a tube of lipstick, so I'm not too fond of using them. I like to have my stuff with me, okay? Speaking of carrying stuff, these bags above are my casual/utilitarian bags. The Manhattan Portage bag was an online purchase because I wanted a bag that I could wear cross-body and have my hands free, but I wanted it to fit a magazine or notebook along with my other stuff. It's quite a few years old now, and works well for an iPad along with typical purse junk. 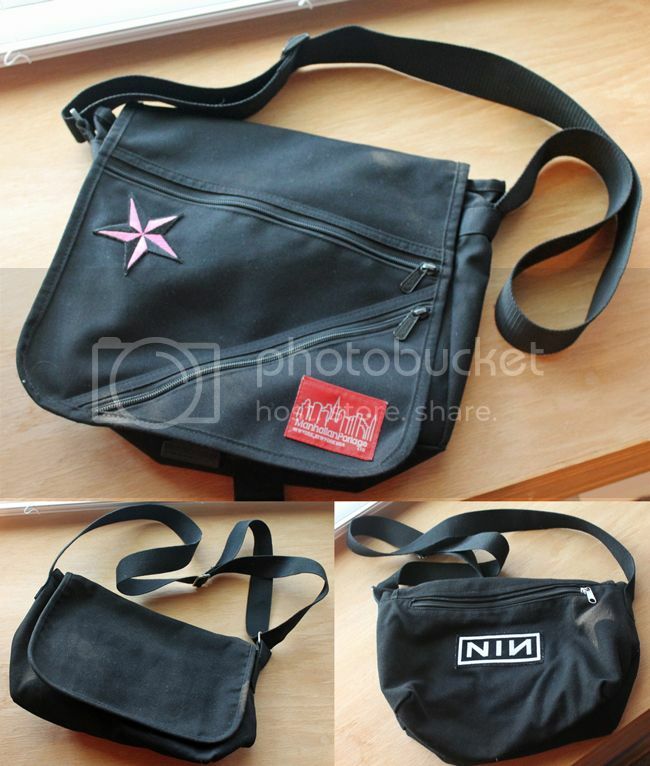 I have a "mini" version purse in the style of the Manhattan Portage bag that I scored for $5 at H&M back in the day, and it's my special concert bag. I can have both hands free, and it has lots of inner pockets for hiding my phone and wallet (less worries about pickpockets and jerks that way), plus I can usually hide a camera too if I'm feeling like it. I also keep a mini fold-up hairbrush, a hair tie, earplugs, an extra inhaler, and eyedrops in it at all times. You know, essential concert survival kit stuff. These two purses above are more like tote bags than purses, although I've used them as both. These are two more shopping scores from Marshall's, and I don't think I had to pay more than $25 for either one! 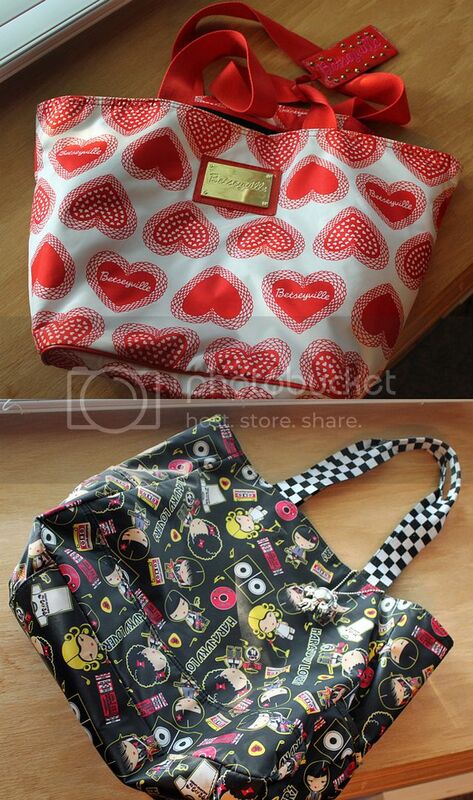 My favorite is the Harajuku Lovers bag. It even came with a tini Gwen charm! Do you have a favorite bag? Tell me about it! So jealous of your harajuku lovers bag!!! At least my little guy can rock harajuku mini clothes! Thanks! I doubt I'll luck out and find another Harajuku bag at Marshall's any time soon!